Marriage is all about responsibilities, yes in deed she is right. Kids are the biggest part this. How beautiful it would be if i can relive that day. Those days I spent alone. He thinks sitting between his pretty angels,coloring their book asking him his approval for the color they choose. Ram is nodding his head. Two eyes got wet seeing him from a 20 foot steps away, praising god for the moment,He and her kids be happy. She never can be him, her tears rolled down her eyes thinking of the days how difficult it is to look after twins with out partner. "yeah... dont know how u carried both in petite stomach" he tried to touch her waist, she flung his hand and went from there. Kids giggled seing their parents,they understood nothing they giggled to their fathers smrink . he went to her back caged her between in strong arms. she continued cooking smiling. "mumma, am hungry!" "me too..." kids voice came out.
" bacche hai... Mr.papa" she smiled. "let me feed them ... go make them sit properly on the table , ram please see ur foody daughter will not finish of the butter..haan.. please u dont join her." she rushed her words and smiled. Ram silently observed the way priya is controlling one and make other eat properly. He took her job as she has to finish cooking. He is feeding the kids in a right way, she thought he is the best father. Both kids came to mom hugged her legs. She knelled down to them.taking them in her arms. "mumma, mein aap jaisa hu na.papa dont like me at all" Pihu asked her mom sadly. Ram stood still hearing this. Priya hugged pihu tight, "no mera baccha u two are half like mumma and half like papa. Riya ki eating habitsare like papa,n ur like me my princess, papa loves u both so much." "mumma, papa will go back to his mumma!" riya asked "haa mumma , tell papa not to leave us again" both kisds spoke their love towards their papa. Priya had a lump in her throat. 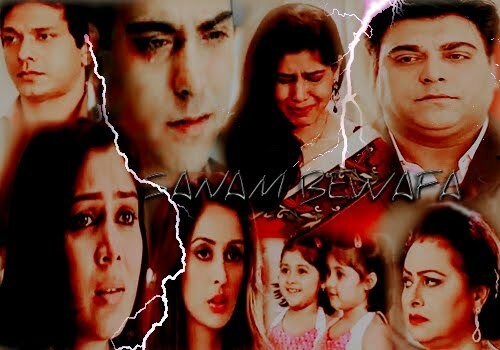 She could not answer it she had tears in her eyes thinking of what made her leave ram. "no baccha .. papa is now here with us .he loves u a lot. So as mumma more than mumma, Just like ur school papa has to go to office. Papa will always love pihu and riya. Just like pihu riya lives with mumma papa has to look after his mother , aap ki dadi aur papa's dadi aap ki badi dadi" she has no left words to say them . actually she has to teach them lot till now its is they 3 now they have a big family,they r kapoor's after all. Ram saw this, she is gulping her words yes in deed they need to talk about this. He came near to them tickling pihu just to lighten the moment. who is that ... said papa dont love pihu.. who .." tickling made pihu giggle. He hugged her. took riya to his arms he gave priya assurance.
" papa will always be with his little angels.."
Elated kids jumped clapping their hands "promise papa" "PROMISE" HE SAID kissing the on cheeks. He saw priya, she blushed thinking- he is not changed a bit, promises every time and for every small thing with a kiss.. raam bhi na.. she went and arranged the table ram helped her. kids were playing . ram made them dress up for the dinner , priya went to get ready .. he went to the room saw her in a elegant white salwar kameez. He gave her the flowers he bought for her. she took them, he hugged her said "u look so beautiful ... now" she pushed him back.. "now! What do u mean..." she pouted. "dont know" he said. "what do u mean u dont know.." she scowled. " i mean to say my wife is prettiest women and my kids mom look much more beautiful ." he smiled. She hugged him. she heard his heart beats, close her eyes in tranquility thinking of those days, when she found her man in a real sense. She stirred in bed, feeling the soft mattress, her hand searched for him.he is lying on his stomach covered with duvet till his waist. She realized her state seeing him, pulled duvet close to her body. Went near to him kissed him on his cheek. He turned to her, kissed her forehead and pulled her close to him.she rested on his shoulder. Let me sleep darling,am tired last night,u dint let me sleep "he said. She hit him in on his chest so mean ram. He hugged her pulled her too closed to him.and slept.she remained admiring his child like face. After a while she slept in his arms. The door banged haard. It was neha and vikram. Both ram and priya woke up, felt shy realizing their nakedness, and the trouble. Ram said arrey yaar these two!.. damn i asked them to come here for breakfast. Ram said. Oh god if they see us like this ! "priya worried. He assured her calmed her down she took ram's oversized t shirt wearing it she left the room , ram changed to his trackpant and t shirt went opened the door. Vikram and neha jumped in, neha called priya. Ram said she is in washroom ,may be! Neha said she will check her. priya just came out of the wash room blushing on her numerous love marks, she stood selecting her dress. Neha came and gifted her a designer sareewhich nuts sent to her bhabhi. Priya took it and wear it. Neha asked priya is she fine! Priya looked pale and yawing . priya just told her she slept more so was little lazy. OMG she beautiful- he thinks, hayee ram looks so handsome and that wet hairs makes him much hot, kassh neha and vikram disappear for a while. After the marvellous night both were eagerly wanting each other,but have to remain themself as they were they were fighting to the world or else neha is immpossible. They arrived at the venue. They walked inside, it was joe nisha's party, they wanna declare their wedding. Neha went to vikram, seeing this ram walked to priya, his pretty wamp came in between asking for a dance. He was force to dance his eyes stuck on his lady, she saw his eagerness to talk to her for a while, she smiled seeing him. she heard- "bhabi.. ek dance" ben asked. "bhabhi " she is suprised . She nodded and gave in to dance with him. "its ok after all ur my dewar" priya danced with him, ram dint like it at all. He constantly seeking her attention but she is deeply engrossed in chit chat with ben. Now he is smitten by the evil jealous. "bhabhi ... help me na.. please i like her but woh tho... aur bhai is so dumb i should say"
"what can i do with ur brother, frankly speaking i want the same u want ." priya said with a smile. It irked ram, priya observed him from the corner of her eye. He wants her in his arms now. He want to punch ben too. So as planned DJ announced partners exchange. Ben got jackie in his arms, he wincked at priya. She could not respond ram pulled her close to him in his arms, tightening his grip on her waist,their bodies gluedto each other spilling all his possessiveness. "what is that u were talking to ben"
"arrey nothing.but let me tell u: bahbhi " dewar ka top secret hai"
"oh .. [calmed down hearing bhabhi] bhabhi uh...[he repeated]"
"yup ..Y? something is burning here!" she giggled. "nothing and it isn't funny..!" " u dance with jackie too"
" hmmm.. btw ben is going to propose her"
"y r u shocked .. at least u will learn to propose at least"
"y do we need to propose, that too after yestarday!.. tell me" she blushed hugged him hiding her face in his arms. neha just prayed to god that this pair should always be happy. Neha's eyes were on love birds , she nudged vikram . vikramand neha suspected something has happened. "baby , don't u think ram and priya arebehaving different." "neha yaar they love each other.. uknow na"
"i know it dear, but don't u see priya is a little more comfortable with ram and humara golu bhi." "haan , they r little more close but a while later they were fighting"
"that's wat. Something is hidden" neha became suspicious. Neha is a crazy for shopping, all four went for shopping. After the lunch ram did not spend time for priya. Ladies are very good in spending where as men in planning. Joe ram vikram are busy in some other preparations. Ram is collecting contact card from eery place they vist. Vikram and joe found it funy.finally men reached women to pay the bills. Ram is ready with his card to be swiped but what a waste,she paid her bill. He scolded her, y dint she let him pay for her. he is angry on her and went to the nearby food court. "Oh god .. priya ..he eats lot when he is annoyed and angry, later suffer with indigestion.. go yaar stop that kid.." vikram said in a worried tone. Priya went to him ... sat infront of him, ram is not talking but continued to eat. Priya sipped the cold cofee from the same cup. She wincked at him. she unpacked all that she bought, his jaws dropped in suprised. Yes it was only for him nothing she shopped for her,she wanted to pay from her own savings. She picked all top brands which suit his strature.shirt, trousers,tie, wallet, watch, cufflings,shoes everything. He picked up the cuffling ,they were made of gold a part is plated with platinum.
" i want to give u something, these materialistics things cannot explain how much u mean to me!" she said. "i love u baby. U already gave memost precious thing." he pulled her to his side. She cupped his face and kissed him on his noes "love u too"
" btw... ur one antique in the world who do these things like over eating in anger.. though u look sooo cute ram" she giggled pulling his cheeks. They shared the cofee and reached the cottage.
" i dont consider it a mistake priya. Last night was so right to me, bu i know will not want it til we get married.. though it is difficult for me i will abide to it"
" ram i love u .. god has blessed me with u.." she hugged him tight. "trist me i know everything about u." "omg .. priya .. how ?" "arrey i wanted to gift to these earlier but i was not in peace, Jackie used to bother me. Now i am secured. And mera dewar tho hai na saath mein" he smiled her. an idea struck his mind. They retired to their rooms to freshen up . after dinner ram came to her room. She slept of all the tiredness curled up like a baby ! .. he slept in the couch watching her. A while later priya woke up seeing ram in a bad position, woke him up to sleep in the bed. "ummm delicious dear, U really cook butter chicken better than any best chef in the world" ram said smacking his fingers. She blushed. Rajath anger is getting more and nore. "what priya u cook NV" daijan asked. "aww so cute.. u both r so adorable... omg some one is blushing" cady said..
" cady behave ur self... btw , yes, it is delicious priya... mrs Priya ram kapoor with double O" rajath said. She gave a fake smile. Rajth saw those same combination of the flowers on kitchen table, priya followed his look , she said i love those roses and ram bought them . every thing is like what ram said. It is his foolishness, to think priya hates ram. Now time to kulfi party. Priya is chatting with dayijaan ,cady rina were busy with cutipies. Ram came there calling for his angels. Rajath is a viewer.
" pihu,riya cady n rina come over here.." al the four rushed.
" ok now, darlings this is mumma's special, priya .. this is for u, am sure u should have missed this but now am here so no more worries" ram said. Leaving priya guess..
" let me gues... dont tell me u ... no ram not now" she said to him..
"ok ram went on his knees,called the two angels to him .showed the bowl with kulfi's. See it kids jumped wow papa kulfi ..they shut their mouth biting their tongue. Puzzled,how do they know about it. I never allowed them to eat but cady..
"arrey it is very tasty.. lelo.. mumma ka fav hai." "haa .. mumma ka fav hai but mumma dont like it." rajath falshed a victorious smile. Ram is a little disappointing.
" riya pihu come here..." priya called them. " r u not sharing kulfi with mumma ! kulfi is much better when it is shared.. that's y mumma said no to, ab ur papa is here so we all can share it ok" priya looked happy. After a long time her desire is going to be full filled. Ram gave kulfi's to every one. There is one left ram smiled giving that one to priya..
" aur aapka kulfi.." priya asked knowing his mischief. He pointed to hers " off-course that's mine .. for got sharing..." she smiled.
" Please ram dont embarrass me". She blushed..
" ok now u relish it" he made her sit beside him ..
" papa aap ka kulfi kaha hai?" pihu asked. "no papa have no kulfi left"
Pihu crawled up to ram gave ram a bit. Riya even came to him gave him a bite, ram is so happy seeing this. They were so much like their mom, he felt he is blessed to have them . priya is so happy seeing them. "papa is there so forgot mumma," priya said as she want to be a part of the happiness. Priya took a bite from riya and pihu shared her kulfi with him. riya and pihu dripped molten kulfi all over them and ram, wiped their hands on ram's shirt and falshed a cute smile and sloppy kiss he melted. This was the best kulfi party i ever had both are in bliss. Cady dayi jaan n rina enjoy a lot cady wished she has her mom n dad alive. Priya went to cady challenging ram that she has her army here, priya hugged cady saying "ur my first daughter as long as i live am ur mom.u and rina r gifted to me. About ur uncle am sure u will be on his side, he is so cool and sweet this ishis extended family." Cady rina hugged her. ram came to them making the moment lite. "accha now tell this who know this secret of kulfi am sure priya would not have spilled it"
"am sure it is cady" priya said.
" woh... i remember u carving for kulfi a week before ur delivery , me and mumma went every where to get u one! Then u said..to mom abt kulfi party. Me rina n these two went to a near by parlour on our way back from school... that day when i topped my +12, ..sorry"
"its ok .. and thanku so much." Ram said and gave side hug..
"rina i told u, they make a good pair " cady said. Ram n priya blushed. "this kadoos kapur.. with u is so disgusting. Ram uncle parcel him to mars please." rina said in a low tone when rajath said will leave. They all went. Ram gave kids a quick bath wrapped them in towels. They were waiting for priya to come n dress them she is busy in arranging clearing her kitchen and living room. Riya ran to priya in the towel. Hugged her legs..
"mumma i want to wear new dress." " no riya not now riya go .. bed time now change to ur night clothes"
"no no no no no no .. i want it " riya is shouting.